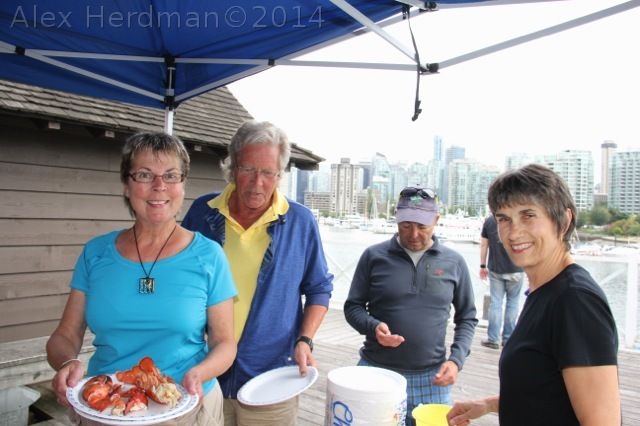 After a week of sunshine, the VRC Summer Regatta started out with some decidedly un-Summer-like weather. Fortunately that didn’t dim the spirits of the 36 skippers and their crew as the sunshine did return on Sunday afternoon. 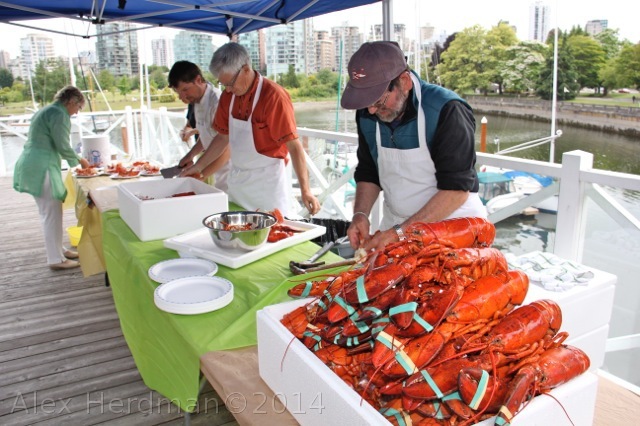 The Lobster Bash was packed with over 160 hungry guests filling the Harbour Room to partake of the fresh lobster and later enjoy the live entertainment provided by Jim Foster & Friends. 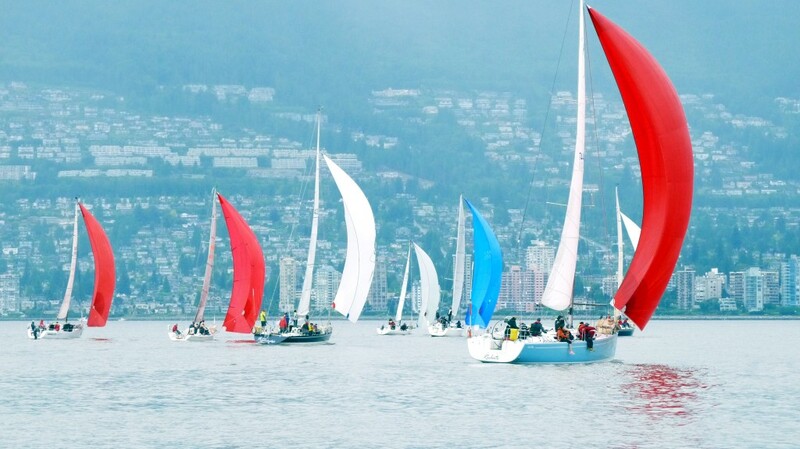 More than 30 yachts proceeded to the starting area in English Bay Saturday morning with light E/NE winds. 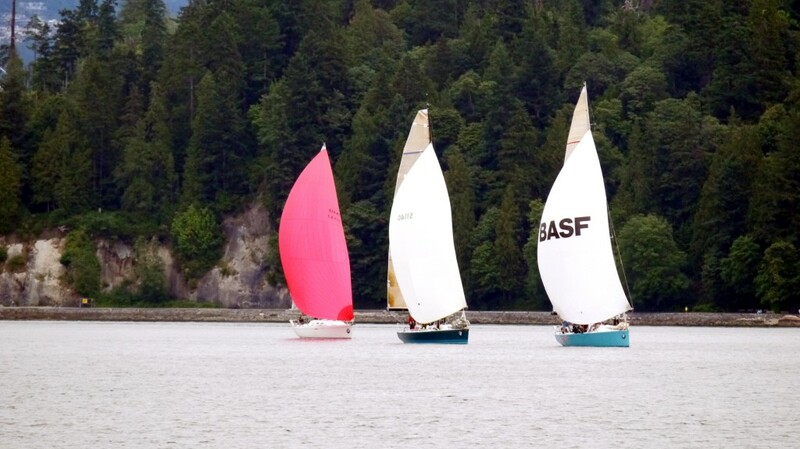 The race committee (RC) set a windward/leeward course with the windward mark towards Stanley Park and racing started on time at 1100hrs with the 7 yachts in Division 1 having a clear start. The next start was a Division 2 & 3 combined start with 16 yachts all fighting for the favored committee boat end. While aggressively approaching the line, the wind picked up slightly and combined with the current pushing boats towards the line, nearly half the fleet was over early causing a general recall. The next start was less aggressive and all boats were clear. Division 7 was next with 10 yachts starting cleanly. After most of the racers had rounded the first mark, the E/NE winds decided to shut off as a new system filled from the West, bring rain showers with it. Yachts that were further North and West got the wind first and took a big lead over their unfortunate competitors. The winds did not stay consistent though as small systems worked their way through the race course. Skippers later reported seeing a Westerly wind clock around to a Northerly and then just shut off, all within a few hundred meters, shortly followed by the next mini-system. As the wind was light and shifty the RC didn’t want to abandon the race and reset the course. It made for an interesting sight as at times nearly every yacht on the course had it’s spinnaker up no matter which direction they were headed. All yachts in Division 1 and 2 finished the course early enough, and the wind seemed to be building so they were giving a second shorter windward/leeward race. Unfortunately the winds were fickle again and no one in Division 2 was able to finish by the 1600 time limit to extend it to 1630. Division 7 was also unfortunate as Maritime Diva sat just short of the finish line helplessly as the 1600 time limit was passed, meaning that the first lap time was used to score the race. 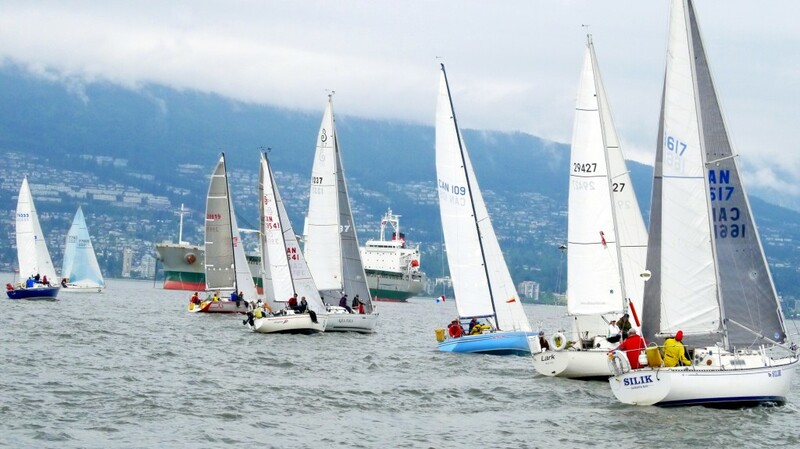 Sailors awoke to grey skies Sunday morning and some heavy showers on the way to the race course. Again the wind was out of the East and with only Division 1 completing more than 1 race the RC set a slightly shorter windward/leeward course. The wind was slightly stronger and turned out to be consistent for most of the day. Division 1 again started right at 1100hrs with a clean start. No general recalls for Sunday, though in some starts there was a yacht over early. As noon passed the showers subsided and the sky brightened. Sailors peeled layers of rain gear off and by early afternoon many were down to shorts and t-shirts. All divisions had competitors finishing within seconds of each other, both in elapsed and corrected times making for some exciting finishes. With the close racing and finally some Summer-like weather everyone was smiling. Having set a shorter course and enjoying stronger wind, the RC did a fantastic job getting multiple races in for each division, while frantically taking finishing times. The last races finished shortly after 1500hrs, giving the RC and racers time to get back to the dock and all packed up before the results were to be announced. Many racers gathered on the VRC patio at 1700hrs to enjoy burgers, refreshments and hear the preliminary results for the weekend. 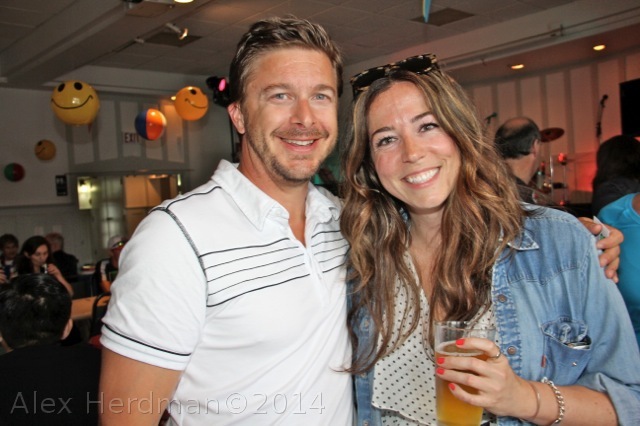 Photos from the Lobster Bash! Look at all those lobster!!! 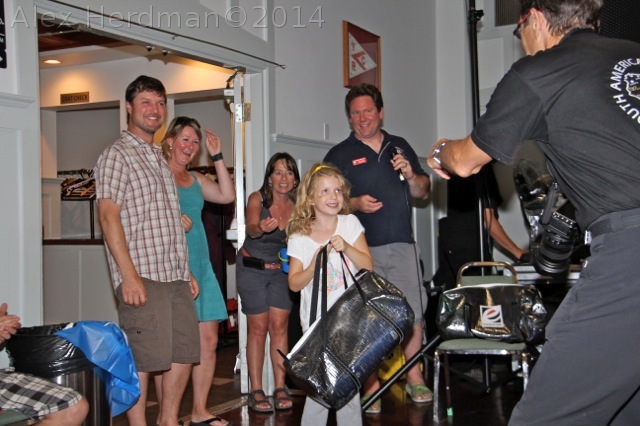 Lots of prizes thanks to Evolution Sails. 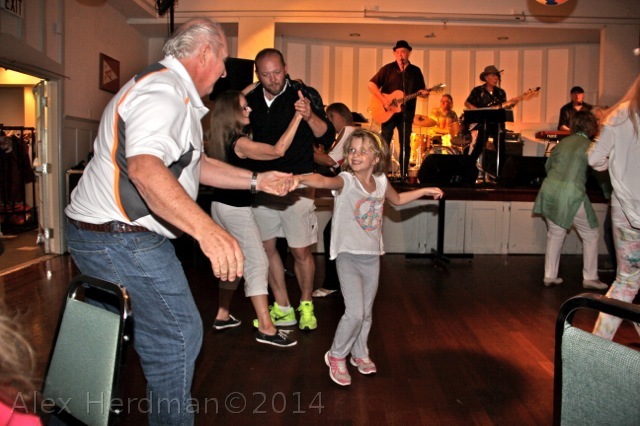 The party went late into the night, everyone enjoyed the music provided by Jim Foster and friends.